Mustangs are wild horses living in herds on public lands and animal reservations mostly in the western United States, but also in limited numbers in Canada and Mexico. Today's modern mustang is a descendent of horses brought to North America by Spanish explorers. They are a mixture of various breeds -- including draft horses -- that escaped from or were abandoned by their owners throughout the American westward expansion. 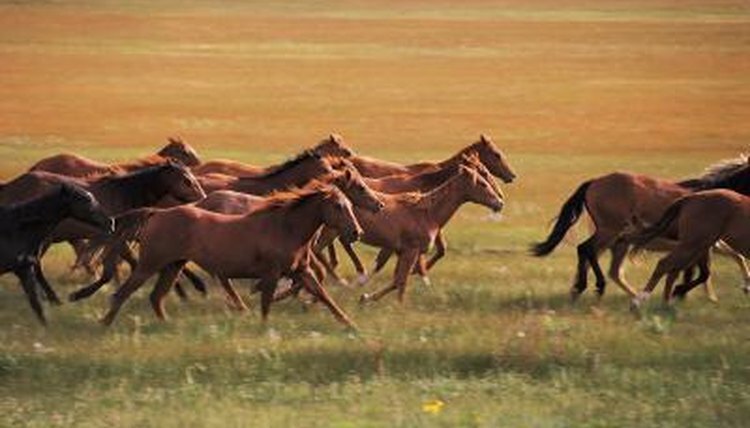 Mustangs live in herds that have a clear social hierarchy. Young males that are no longer under the care of their mothers but have not reached breeding age run in a herd together, according to the National Park Service. Between 2 and 3 years of age, these males begin their own herds by attracting fillies from other herds to join them. Most herds have one stallion and anywhere from two to eight mares with their foals. The stallion is responsible for impregnating the breeding-age females and protecting the entire herd from predators. The lead mare leads the rest of the herd away from danger until it passes. Mustangs horses are herbivores -- they only eat grasses and grains. Yet the grazing lands they roam do not grow vegetation that is high in nutritional content. Often, especially during hot, dry months, vegetation such as coarse grass, sagebrush and juniper naturally growing on grazing lands is scarce. Mustang horses have learned how to subsist on low-quality food that is not abundantly available. Mustangs know how to access water even when weather conditions make that quest challenging. In warm, dry seasons, they know how to chew through prickly cactus to draw moisture from the plant. Mustangs have learned how to paw through the edges of ice-locked ponds, watering holes and natural springs in the winter without jeopardizing themselves by falling through the ice. The wild grazing areas where mustangs live is also home to numerous predators that target young, vulnerable foals. To compensate for the danger, mustang foals are born sporting a sandy color that blends in with their environment. They also are extremely nimble post birth -- they stand within minutes and are often ready to run within just a couple hours of being born. The population of mustang horses in the western United States in the 17th century was estimated between 2 and 4 million, according to the National Mustang Association. Misguided efforts at population control due to the pressure of ranchers and farmers wanting the land for cattle solely rounded up herds of mustangs and sent them to slaughter. In 1971, the U.S. Congress passed the Wild Free-Roaming Horse and Burro Act, recognizing mustangs and wild burros as living symbols of the history and pioneer spirit of the American West. Today, mustangs are allowed to freely roam the more than 264 million acres of public lands managed by the U.S. Department of Interior Bureau of Land Management. National Mustang Club: What is a Mustang? Treehugger: Vanishing Mustangs: are America's Wild Horses in Danger of Disappearing?